To begin the walk go to the west of the Market Place (Ripon direction) and enter Castlegate. Take the alley on the right beside Lee’s butchers which leads to the grassy area of Castle Garth, the site where Thirsk Castle once stood and where you will find board 1 on the left of the path. Unfortunately this is mistakenly labelled board 3! In the summer of 1994 an archaeological excavation took place on this part of the site in connection with the installation of a sub-station by Northern Electric. 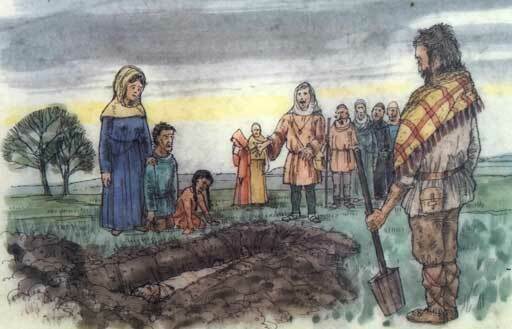 The dig revealed a hitherto undetected sixth-century burial site. This discovery confirmed the belief that Thirsk existed as a settlement long before the arrival of the Normans in the late 11th century. When the Roman Legions were withdrawn from northern Britain in AD 402 there were already people from the north-western part of Europe settled here as part of the Roman army and as time went by they were joined by more immigrants from across the North Sea. The folk settling in Yorkshire were Angles rather than Saxons and by AD 560 an Anglian chieftain called Aella ruled over a north-eastern kingdom called Deira. The graves found here belong to the first half of the sixth century and the artifacts associated with them are in a typically Anglian style. The archaeologists found that graves had been disturbed at a later date, probably when the castle ditch was dug, but had not been robbed. From the size of the bones found in one of the graves we know that the man buried there stood about seven feet - well over two metres - tall. Were there giants in those days? 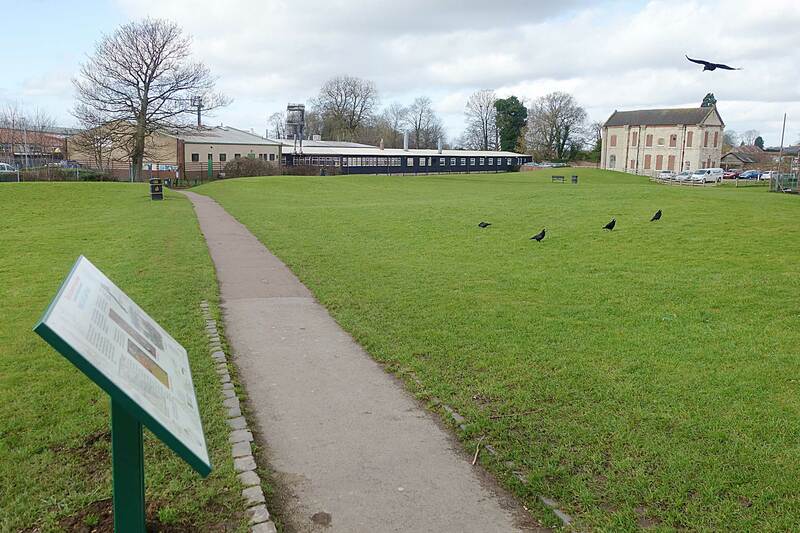 Full details of the 1994 dig and the finds from the site can be found at Thirsk Museum in Kirkgate.